Randy Evert's close encounter with George Reeves . 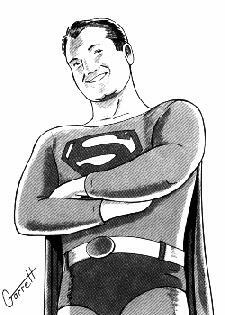 . .
Few of us have ever been fortunate enough to have met George Reeves. What a thrill it would have been to meet him, to shake his hand, to share even one moment. A few years ago as I was doing research, I ran across an article in the Reading Eagle. In the summer before the final season of Superman, George, along with Noel Neill, Natividad Vacio, Gene LaBelle, and a few musicians, made a tour of state fairs. Among their cities on their tour was Reading, Pennsylvania. I lived only a few miles from Reading, but evidently didn't read the newspapers in 1957 and therefore missed my chance to see George Reeves in person. It is a missed opportunity I shall forever regret. In the past couple years, however, I've learned that others have been more fortunate as you will see when you read this letter from from Randy Everts. Jim, I saw your page on George Reeves and thought you might find the following of interest. I was born in Hollywood in 1946. So, like you, I was a kid when the Adventures of Superman first aired. I loved the shows, and Reeves was one of my idols. In those days, I went to school with Teddy Tapscott whose father was actor Mark Tapscott. Teddy lived midway between Portola and Reeves' address on Benedict Canyon. Another good friend was "Tiger" Lorimer who later studied with Segovia in Spain and became a musician. I used to walk or bike down to friends' places sometimes, and one day Tiger asked me if I knew that Superman lived a few houses away from me. Of course I didn't believe him, but just in case, I stopped at 1579 Benedict Canyon Drive a few days later and knocked on the door. In fact, I'm pretty sure I stopped and knocked several times, and one day a man did answer. However, the man who answered was a man I didn't immediately recognize. Unlike Superman on television, this man had thinning greyish hair, and yet ... after taking a closer look (and asking him outright to make sure), I was convinced that the man standing in the doorway was, indeed, Superman. I asked him for an autographed picture, and you can't imagine my distress when he told me that he didn't have one. Sensing my disappointment, however, he promised to leave one for me in his mailbox along the street. I checked a couple times, and true to his word, a few days later, there it was! In fact, it was the very photo you have at the head of your main page. Along the bottom was the standard printed salutation, but on the front was written, "To Randy, best wishes, Superman." A few days later, I saw Reeves once again. I was biking up Benedict Canyon and recall seeing a car pull out of his driveway. As it sped by, the person inside the car, a kindly smiling man with thin, grayish hair blowing around in the breeze, waved at me. Since, as I recall, I told him that I had wanted that photograph for my 13th birthday, this final encounter with Reeves happened in late May, 1959. Less than a month later my parents told me that George Reeves was dead.